My client was speaking to me from her bed. She had advanced pancreatic cancer. Her pain was deep and constant. She wanted relief, and she wanted heavy massage. I’ve had this conversation many times. It’s a crossroads moment. My role, my compassion, my ethics all collide in my brain before settling. I breathe a bit before I respond. Suppose this was your client. She is ill, nearing the end of her life. She is in constant pain. She just asked, perhaps begged, for deep pressure. What do you do? Students have asked me what to do. Teachers have advised what to do. On Facebook, MTs tell each other what to do. Kicking around in those discussions is this advice: “At end of life, give the client whatever they want.” Even if that involves heavy pressure. The reasoning goes like this: The client does not have much time left, so it’s time to do what they ask. The usual precautions must not apply in this circumstance. I appreciate the feeling that drives this advice. It is a call to ease suffering and pain in difficult circumstances. But “Give them whatever they want” is the wrong message. This situation calls for more caution, not less. Care and caution are supremely important when working with people at end of life. 1. “The customer is always right” is not a moral imperative. Although client-centered care is a good goal in massage therapy, it can sometimes border on the old cliche, “the customer is always right.” People pay their money and they make their choice, and it’s our role as helping professionals to respond to that choice. When a client is hurting at end of life or during serious illness, we might feel obligated to provide whatever they want. Surely the level of pain trumps all the usual precautions. Surely the client knows best what she needs. But we are not in the business of granting everyone’s wishes. Client satisfaction is only one of many considerations in our plan of care. And as popular as it is to believe that everyone knows what their body needs in every moment, there are plenty of examples of human behavior that suggest otherwise. In this situation, one of our professional responsibilities is to zoom out and think carefully, and to question the view that this customer is always right. For reasons listed below, we may have to take on a strong leadership role, ensuring that more caution is used, not less. In our professional role, the ultimate responsibility for a massage session lies with us, not with our clients. 2. In palliative care, we consider side effects. Palliative care focuses on relief of pain, anxiety, nausea, and other problems. In these efforts, symptom-relief measures and dosages are carefully balanced against their side effects. • Bruising and pain. Deep or medium pressure could cause bruising, increased pain, anxiety about that pain, or reduced function. Liver compromise is only one factor at end of life can lead to easy bruising and bleeding. • Blood clot risk. Many, many people at end of life are at elevated risk of DVT. About half of blood clots are asymptomatic—there is no sign of DVT it in the lower extremities where it often begins to form. This is truly chilling, as a massage therapists working with clients at end of life must take care with pressure and joint movement on the lower extremities, avoiding even the appearance of contacting deeper vessels. Why? Loosened, a blood clot can be dangerous or even fatal. Blood clots can also form in other places in people who are seriously ill, so massage therapists do well to educate themselves and consider the risks carefully in each client. • Fluid balance. End of life conditions can cause precarious fluid balance problems, in the event of kidney, liver, or heart failure. Swelling can be present for a variety of reasons. Some have lymphedema or are at risk of it. Although it is tempting to go at the swollen tissues and try to ease swelling, incorrectly applied massage or heat could make things worse. In most cases, the massage therapist’s intent should be to leave things as they are, not to redistribute fluid from compartment to compartment. • Bone integrity. In advanced cancer and other conditions, clients might have compromised bone integrity that is not obvious to an observer, and medium-pressure massage or strong joint movement could lead to fracture. In my client, several of these factors were at play. There were multiple bone metastases and liver function compromise. Her DVT risk was elevated for several different reasons. These factors are not necessarily intuitively obvious. They take some digging. I understood them from an initial intake of targeted health question, months of working with her, and my own follow-up research. I considered all of these things in my conservative approach. Had I reacted only to the request for more pressure, and made a snap decision to comply with her wishes, I could easily have over-treated her with massage and caused discomfort or worse. The risk would be heightened if we had just met, and had no history of working together. The goal of massage for a client at end of life is palliation. As such, massage therapists work within palliative care practices. No matter how you see yourself—as a health care practitioner, as a massage therapist who wants to be accepted as a health care practitioner, or as a provider of an entirely separate service—you are bound to the ethic of doing no harm. 3. This is not just between the therapist and the client. By its nature, a massage session is private. What happens in the massage session may forever stay in the massage session, especially when a client is near the end of life. This reality might tempt a therapist to go with a client’s request and be less cautious. After all, no one else will know, right? The MT is responsible to only the client? In my massage therapist role, the client is not the only one to whom I am accountable. There are others in the picture. Even after the client passes, I answer to the client’s family and health care team. If I have stepped out of the usual protocol and done harm, or even if it appears that I have done harm, I answer to everyone in that client’s circle of care. Some of you might also be accountable to a supervisor, employer, or third-party payer. All of us are accountable to our profession, professional organizations, licensing boards, and providers of liability insurance. We are accountable to each other. Clearly, there is plenty of accountability, and it extends well beyond the client-therapist relationship. Suppose a massage therapist provided deep work that seemed to provide relief, but the client’s pain worsened in the hours afterward, possibly due to the injury of delicate structures. Suppose strokes in the wrong direction aggravated or precipitated lymphedema. Suppose a client became nauseated or developed flu like aches, which can follow even a medium pressure massage in a medically frail client. Such a massage can be too stimulating. Side effects of over-treatment might set in motion a cascade of medical interventions that are expensive, that no one wanted, and that cause great emotional pain and suffering to the client and client’s loved ones. At end of life, the stakes are especially high. 4. You cannot be sure that your intuition will guide you. The role of intuition in decision making warrants a longer discussion and possibly a whole blog post in itself. For now, I’ll note that intuition can be fallible. Neither you nor I are endowed with perfect intuition at every moment of our working lives. My intuition easily fails me when I am short on sleep or food, or long on stress. I make poor decisions sometimes, even when I think I’m following my gut. And that’s just me; massage therapists have told me many stories of following their instincts. Even though I wasn’t there, even though things might have turned out fine, the decisions they describe often fly in the face of common sense, common health care practices, and even common practices in massage therapy. If your client asks for more pressure and your intuition agrees, I hope there is more in the mix than those two messages. Even though intuition, by itself, is highly prized in massage therapy, intuition is best honored as part of a set of skills, not as a single compass. Nurses and doctors who successfully “go with their gut” typically have years of experience and a whole raft of skills to go with that intuition. Other factors such as good information, communication, and reasoning round out our clinical skills as massage therapists. Take care not to glorify intuition or rely on it in isolation. A more fully formed clinical decision making process is necessary to get through tricky territory. A client’s acute distress is compelling, and necessarily becomes a central focus. It often causes waves of distress in the loved ones surrounding the client. Such a scenario hits us deep in our hearts. We want to roll up our sleeves and go to work on that distress, seeing to as many needs as possible at the expense of our own. We want to do whatever it takes, and if it takes extreme pressure, then we want to provide it. It seems heartless to withhold it. But it is possible, at once, to offer compassion and set limits. I can deny a request for heavier work without diminishing it. As the therapist, I am in this picture, too. I have my own needs and responsibilities to honor. I need to sleep well at night, with as few misgivings and mistakes as possible to haunt me. With thousands of massage sessions ahead of me, I don’t have energy to squander on inner conflict or poor decisions. I need the peace of work done safely and well. In fact, with clearly drawn lines around what I will do, I can step into my work with my fullest heart. My compassion comes easily. It comes through gentle hands rather than heavy ones. Working gently works for me. I need to make it work for my client. 6. Heroics can be a rush, but don’t rush in. Many forces come into play in compelling situations such as end of life care. Our old pains and fears about death, our pesky egos. Our history of watching people die, the times we could help and the times we could not. We come by our own pain honestly, but it confuses our decisions sometimes. Faced with our internal discomfort, we hurry to do something about it. The impulse to give in to a client’s request may arise from our own reaction to our own discomfort. It’s hard to tolerate someone else’s pain and suffering, much less our own pain that bubbles up, so we act quickly to relieve it. Why else would we hurry? I like to think of myself as someone who can fix problems. (Someone left the door open and let my ego out!) To serve this image of myself, I might be more likely to rush to solutions, bypass the usual precautions, and give deep pressure to someone asking for deep pressure. In a hurry, my judgment can be compromised. But the client needs help, not heroics. We are practicing massage therapy, not emergency medicine. It’s good to keep some impulses in check. Most situations allow us some time to consider what to do. The best massage approach includes a thinking pause. Consider tissue stability, and all the factors that might compromise it in certain areas. Think through which organs are under-performing, and how that affects the rest of the body. And in the off hours? Spend some time in reflection, healing the pain and fear that can interfere with good judgment. Read about end of life, explore the depths. Take part in a hospice volunteer training. Start or join an ongoing conversation about death. Get some help, and get cozier with the reality of where we are all headed, and what we need to heal ourselves along the way. 7. In palliative care, we also work as part of a professional team. At its best, palliative care is provided by a team of experienced professionals who follow standard practices in symptom relief. Health care providers increase or decrease a dose as carefully as possible. Patient care is layered. Multiple factors are considered. This is not a time to go rogue. Instead of taking matters into our own hands, instead of riding cowboy-style into a solo effort, massage therapists need to assume a role as part of a team. It is time to respect the work of the team, and integrate massage therapy as seamlessly as possible into the care of the patient. How does this look in action? Gentle work. Risk under-treating rather than over-treating. Follow-up and monitor results where possible. When we remember to first, do no harm, to consider dose, intensity, and side effects, we can avoid the pitfalls of over-treatment. With checks on the impulse to overdo it, we can be more helpful. By using a set of clinical skills, rather than relying on intuition alone, our work is both fully-formed and well-informed. By honoring our own needs and those of everyone else to whom we are accountable, we take our place in the circle of care. Massage therapy is poised gain real traction in the world of pain control, supportive care, and end of life. If we go in with a healthy dose of humility rather than an inflated sense of our skills, we will build more bridges and help more people. As team players, we can be more effective. When we learn to communicate with clients and care providers about all of this, we take leadership. With care and thought, our role in end of life care will earn greater recognition. After the client’s request for more pressure, I sat down beside her. I breathed, and looked her in the eye. I told her I had a good sense of her request and the need she was expressing, and I wanted to address her pain as well as I possibly could. I listened. I asked her to describe her symptoms more fully, and to point to areas of discomfort. I listened carefully and asked questions. This time, I said, we would pay more attention to the areas of pain. Then I reviewed the tools I had at hand and told her, from experience, that I thought these measures could help: Setting up comfortable and supportive bolstering. Gently working at tension and stiffness in her muscles. Occasionally asking her to “breathe into the place under my hands.” Long, quiet strokes. Simple, still hands holding the tissues. My client agreed with the plan a bit halfheartedly, but she said she understood, and I went to work. An hour later I packed up quietly, in case she was asleep. As I tiptoed out, she called out sleepily to thank me. She had found some relief. She felt better, and so did I. *None of the examples, above, provides a full discussion of the signs, symptoms, risks, or possible scenarios to consider at end of life. There is much more to DVT, hepatic failure, bruising, and cancer with bone involvement. Further understanding is essential for MTs working with medical compromised clients. Resources are below, but more are out there, and a MT provides the safest, best care to clients at end of life after a good dredge of the literature and a good face to face training. Great blogs and trainings on massage at end of life, massage for people who are aging, and massage during serious illness. MacDonald, Gayle. Medicine Hands: Massage Therapy for People with Cancer (3rd ed). Forres, Scotland, Findhorn Press, 2014. Walton, Tracy. 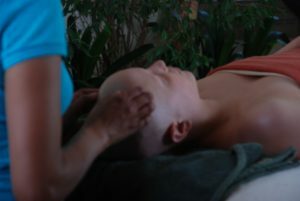 Selling Gentle Massage to Clients with Cancer. Massage Today, 14(2). February 2014. 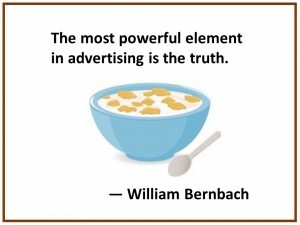 William Bernbach, a famous advertising executive, gave us Mikey and his bowl of Life cereal in the 1970’s. A wildly successful ad campaign, it became a classic. It reportedly ran for 12 years. In the 30-second spot, Mikey’s older brother’s are skeptical of a cereal that is “supposed to be good for you.” So they push the bowl over to Mikey, to see if he will try it first. Mikey is an unassuming, freckled, round-faced 3 year old in a red turtleneck. You can barely see his head over the large bowl of cereal placed in front of him. His brothers watch and wait. Mikey considers the cereal for a moment. Then, undaunted, he digs in and wolfs it down. Turns out, he likes it. The plain truth can sell a lot of things, from cereal to solar energy. Truths that taste good are hard to refute. Truths that shrink a carbon footprint are compelling. We can harness this simplicity in massage therapy. Truths about massage therapy can help us sell massage therapy. But What if We Don’t Know What Those Truths Are? From day one in massage school, I was told that massage elevated blood flow. I also learned that massage boosted endorphins and immunity, lowered cortisol, and eliminated toxins from the body. Much attention has been given to these supposed effects, and most of us were told these things in the classroom, in the literature, or in the sheer volume of massage advertising. Yet a closer look at the research suggests that we don’t know these effects for sure. Our certain-sounding statements have been based on primitive studies or wishful thinking. In some cases, research contradicts the claims we’ve been making for decades. Now, years later, it seems time for a roundup of what we know and don’t know about massage therapy. Many of our long-held assumptions and beliefs are getting a closer look. To that end, I’ve put together a free e-book focused on some of the things I learned in school. 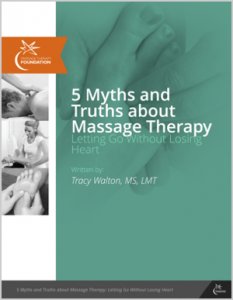 5 Myths and Truths about Massage Therapy: Letting Go without Losing Heart is available from the Massage Therapy Foundation. It’s in the lineup of many free resources they provide to massage therapists and the people who love them. The e-book is one quick click and a download away, right here. I focused it on massage and blood flow, endorphin levels, cortisol levels, immunity. I also address the question of massage and toxin release, a subject of countless discussions on social media. In the book, I discuss how we really can let go of unfounded claims without losing heart. Our clients rarely ask for lower cortisol or boosted endorphins, so they won’t miss them. Our message is complicated by our stories of massage prodding cells and molecules in certain directions. We’ve tied ourselves into knots, pointing this way and that way at studies that were too small for firm conclusions. By clinging to some old, unfounded claims, our massage promotions have been missing the mark. We could take guidance from packaged cereals, where the ingredients and nutrients are listed on the box. We would do well to follow the lead of health care providers, who are bound by ethics to keep to true claims about their treatments. If we want to be part of real health care, we need to state real benefits of massage. Truth in advertising is an ethical responsibility, but it’s also more effective marketing. More responsible claims about massage are easier to defend than unsubstantiated beliefs. They earn us better ethics and higher credibility. We can leave behind massage therapy’s sacred cows without giving up much. Those outdated claims no longer serve us, so there is no need to cling to them. Like Mikey, some of our clients come for massage because they like it. They can tell that good touch is good for them. Most Clients Want to Feel Better. In contrast to some of our iffy-er claims, there is growing research support for the notion that massage helps anxiety, pain, and depression. Who doesn’t know someone with anxiety, pain, or depression? Who hasn’t experienced those things for themselves? These are compelling. In massage therapy, we’ve been focused on the smaller effects: What we call the mechanistic outcomes of massage, like changes in blood levels of endorphins, cortisol, this or that. This detracts from other, growing support for clinical outcomes. Mechanisms are important, yes, but not as an exclusive focus of our research, our websites, and our literature. The Massage Therapy Foundation gives us regular, reliable updates about the effects of massage. The Foundation tells us whether massage helps certain conditions, and sometimes why and how it helps. It is one source of massage therapy research that is in process. The Foundation email newsletter is a fine one to find in your inbox. For now, we need to work on our packaging and labeling. Cereal boxes tell us what’s inside and what is not. Consumers decide whether to buy the gluten, oats, refined sugar, or nuts. With the occasional exception of a fresh fruit topping that isn’t part of the deal,** what you see on the package is pretty much what you get. Clean, simple claims about massage are a clearer call to those who need our help. Without distracting fanfare about toxins and endorphins, consumers can better understand our work. We move massage therapy forward when we leave behind what was never there in the first place. Plain labeling puts us on sturdier ground. The Best Advertising is the Truth. Skilled touch is food. People are hungry. Let’s feed each other food. Thank you to the Massage Therapy Foundation and all its volunteers for making 5 Myths and Truths about Massage Therapy happen. Most especially, thank you to Michael Reynolds of Spinweb for designing it, and Melissa Finley and Joe Russ of Anatomy in Motion for sponsoring the e-book. Check out all of the Foundation’s free e-books and other resources. Even better, throw them a little love money in an end of year donation. I promise they’ll return the love. …For a massage claim to be accurate, it needs to be backed by the strongest evidence. Yet some of the massage studies we’ve quoted for years are neither strong, nor conclusive. In a few weeks, the Massage Therapy Foundation will release my free e-book, “Five Myths and Truths about Massage Therapy.” When it’s up, I’ll link to it here. In preparing the book, I reviewed a lot of massage research. I also reviewed a lot of reviews of massage research. In a research review, someone else already waded through the research, rated it and reported their conclusions. These days, consumers make a lot of decisions based on reviews and ratings. One star, five stars. Fit too small, chapters too long, service too slow. Fit perfect, page-turner, excellent service. For those without the time to try on 18 pairs of shoes, reviews are real time savers. In health care, reviews are time savers, too, but at a much higher standard. No hiding behind an anonymous screen name. (I’m talking to YOU, BatmanFan472.) Not so fast with the rant or the bad experience. Typically, research reviews meet established standards of thought and transparency. Far from the haste of the average Yelp yelp, a good research review takes months to write. Good thing, because many practices in health care are based on these reviews. Most practitioners don’t have the time or skills to analyze all the research in their profession. They need someone else to review it for them. In massage therapy, we need that, too. It takes at least one high-level research review to truly settle a question. In massage therapy, we got by for years on hearsay and testimonial (the equivalent of the modern day online review) about the benefits of our work. In better moments, we’ve zoomed out and seen patterns in our practice–a certain approach that seems to lead to certain outcomes. Better sleep, fewer headaches, more flexibility. Our data was empirical, limited to our observations. So we all cheered when massage research started to appear in the literature. We pointed to this study or that one to “prove” its benefits. Typically, our claims about massage rested on a single randomized, controlled trial (RCT). Yet even a good RCT has its limits. It’s from a single group of investigators, in a single time period, with a single sample of research subjects. Mistakes happen. Bias happens. Something gets skewed. Only a handful of people were tested. We’re still on shaky ground when we depend on a single study to back up our claims. Instead, a large body of research–multiple studies–are needed to tell us anything conclusive. That’s where the research reviews come in. 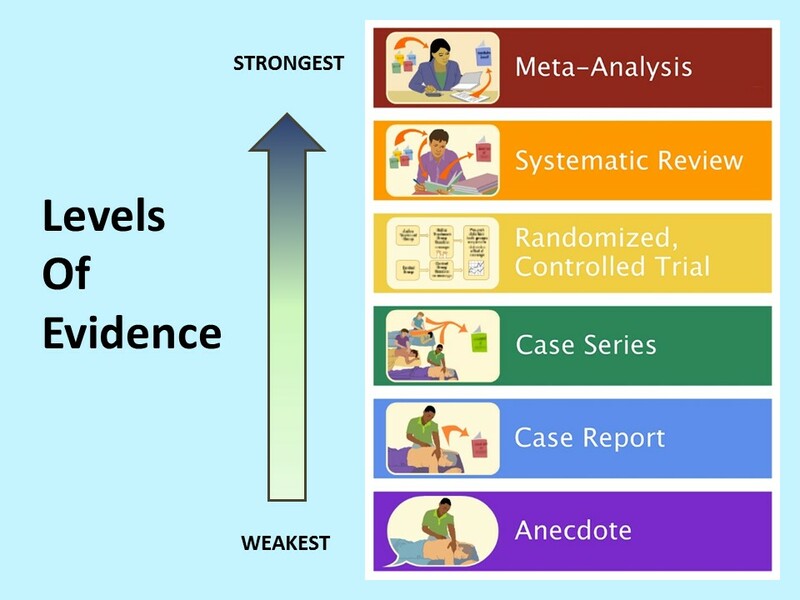 More accurate information can be found in a good systematic review of the research, which is higher on the research ladder than a single trial. A systematic review tells us whether (or not) massage does what we say it does. From dredging the literature, the reviewer can return a yes, no, or maybe. I explain all these massage cartoons in the e-book. I promise. Now look at the top of the ladder. 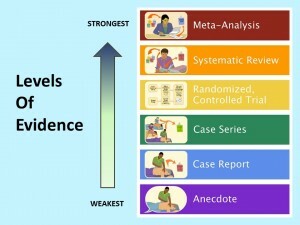 The highest, strongest level of evidence is a meta-analysis. A good meta-analysis is a systematic review that quantifies the effect of massage, telling us how strong the effect might be. In clinical research, it’s an ultimate search for truth. In massage therapy, we should look to these reviews, rather than a single study, for the benefits. Here. I made you a thing. It’s a list. I’m sharing a pile of systematic reviews and meta-analyses below. Here, you’ll find reviews of massage research on everything from cancer to depression to blood pressure. Presumably some of the reviews show stronger analysis than others, but I haven’t rated or reviewed them. To analyze each analysis would require much higher level research skills than I possess, so I’m leaving the list of reviews unreviewed. Some of the articles are free for the taking, and there are links to the full article. Otherwise, I’ve shared links to the abstracts (summaries) of those reviews at the US National Library of Medicine. These reviews tell us, at a glance, what the authors saw in a body of massage research. Some of the conclusions might surprise you. Some are disappointing. They don’t say what we want them to say. But I think our profession is big enough to handle it. I believe that true seekers of healing are also seekers of truth. The truths unearthed by good clinical research will have much to teach us about the effects of massage and how it works. For now, there are a lot of gaps in information. The gaps remind us that there is still a good deal of mystery in massage therapy, and that we live with both the known and the unknown. In massage therapy, the better we get at discerning the difference, the stronger we grow as a profession. Either way, read to your heart’s content. And keep an eye out for the massage myths e-book! I’ll post a link here. Xiong XJ, Li SJ, Zhang YQ. Massage therapy for essential hypertension: a systematic review. J Hum Hypertens. 2014 Jul 3. oi: 10.1038/jhh.2014.52. [Epub ahead of print]. Abstract at http://www.ncbi.nlm.nih.gov/pubmed/24990417. Ernst E. Does post-exercise massage treatment reduce delayed onset muscle soreness? A systematic review. British Journal of Sports Medicine. 32(3): 212-14, Sept. 1998. Free full-text article at http://www.ncbi.nlm.nih.gov/pmc/articles/PMC1756095/. Keeratitanont K, Jensen MP, Chatchawan U, Auvichayapat P. The efficacy of traditional Thai massage for the treatment of chronic pain: A systematic review. Complement Ther Clin Pract. 2015 Feb;21(1):26-32. doi: 10.1016/j.ctcp.2015.01.006. Epub 2015 Jan 3. Abstract at http://www.ncbi.nlm.nih.gov/pubmed/25682523. Kong LJ, Zhan HS, Cheng YW, Yuan WA, Chen B, Fang M. Massage therapy for neck and shoulder pain: a systematic review and meta-analysis. Evid Based Complement Alternat Med. 2013; 2013: 613279. Published online Feb 28, 2013. doi: 10.1155/2013/613279. Free full-text article at http://www.ncbi.nlm.nih.gov/pmc/articles/PMC3600270/. Lee SH, Kim JY, Yeo S, Kim SH, Lim S. Meta-analysis of massage therapy on cancer pain. Integr Cancer Ther. 2015 Jul;14(4):297-304. doi: 10.1177/1534735415572885. Epub 2015 Mar 17. Abstract at http://www.ncbi.nlm.nih.gov/pubmed/25784669. Pan YQ, Yang KH, Wang YL, Zhang LP, Liang HQ. Massage interventions and treatment-related side effects of breast cancer: a systematic review and meta-analysis. Int J Clin Oncol. 2014 Oct;19(5):829-41. doi: 10.1007/s10147-013-0635-5. Epub 2013 Nov 26. Abstract at http://www.ncbi.nlm.nih.gov/pubmed/24275985. Wilkinson S. Barnes K. Storey L. Massage for symptom relief in patients with cancer: systematic review. J Adv Nurs. 2008 Sep;63(5):430-9. doi: 10.1111/j.1365-2648.2008.04712.x. Abstract at http://www.ncbi.nlm.nih.gov/pubmed/18727744. Tejero-Fernandez V, Membrilla-Mesa M, Galiano-Castillo N, Arroyo-Morales M. Immunological effects of massage after exercise: A systematic review. Phys Ther Sport 2014 Jul 21. pii: S1466-853X(14)00062-5. doi: 10.1016/j.ptsp.2014.07.001. [Epub ahead of print]. Abstract at http://www.ncbi.nlm.nih.gov/pubmed/25116861. Bennett C, Underdown A, Barlow J. Massage for promoting mental and physical health in typically developing infants under the age of six months. Cochrane Database Syst Rev. 2013 Apr 30;4:CD005038. doi: 10.1002/14651858.CD005038.pub3. Wang L, He JL, Zhang XH. The efficacy of massage on preterm infants: a meta-analysis. Am J Perinatol. 2013 Oct;30(9):731-8. doi: 10.1055/s-0032-1332801. Epub 2013 Jan 15. Abstract at http://www.ncbi.nlm.nih.gov/pubmed/23322391. Coelho HF, Boddy K, Ernst E. Massage therapy for the treatment of depression: a systematic review. Int J Clin Pract. 2008 Feb;62(2):325-33. Epub 2007 Dec 11. Abstract at: http://www.ncbi.nlm.nih.gov/pubmed/18081800. Hou WH, Chiang PT, Hsu TY, Chiu SY, Yen YC. Treatment effects of massage therapy in depressed people: a meta-analysis. J Clin Psychiatry. 2010 Jul;71(7):894-901. doi: 10.4088/JCP.09r05009blu. Epub 2010 Mar 23. Abstract at http://www.ncbi.nlm.nih.gov/pubmed/20361919. Smith CA, Levett KM, Collins CT, Jones L. Massage, reflexology and other manual methods for pain management in labour. Cochrane Database of Systematic Reviews 2012, Issue 2. Art. No. : CD009290. DOI: 10.1002/14651858.CD009290.pub2 – See more at: http://summaries.cochrane.org/CD009290/PREG_massage-reflexology-and-other-manual-methods-for-managing-pain-in-labour. That’s it for now, but more could pop up next month! To find reviews on your own, go to the National Library of Medicine and select “Review” under “Article Type.” This will filter out the other papers and select research reviews. One Massage Study Does Not Prove a Point.